How is L&D strategy conceptualized in the digital age? Over the course of my career (30+ years! ), our field has seen a dramatic expansion in the range and scope of the work that we do to support learning and performance in organizations. There was a time when almost all talk about developing people in an organizational context focused on various forms of training. And we learned to design all kinds of training quite well, whether the deliverable was a classroom training program, an e-learning module, an on-the-job training plan, a peer mentoring program or some other formal, organization-driven strategy. More recently, we have come to appreciate that people grow their knowledge and skill base in multifaceted ways, and we have begun devising strategies (at the enterprise level and at the project level) that cater to the needs of modern learners. Our choices are much more nuanced than structured training vs. whatever-learners-can-find-on-an-internet-search. We need to be able to customize our recommendations to the needs and context at hand. As Doug Thomas and John Seely Brown wrote in A New Culture of Learning, “the challenge is to find a way to marry structure and freedom to create something altogether new.” A blended training program may be perfect for one project, while another requires a more flexible, learner-driven approach that provides curated resources. Many experienced professionals and thought leaders have crafted signature frameworks for thinking about how to put together learning strategies for modern learners. Each of these approaches offers a different way of crafting potential solutions – an original take on that “something altogether new” that might prove useful. In order to be effective, it makes sense that L&D professionals should have at least a baseline understanding of the range of these strategies so that when we engage specific projects, we can quickly decide what might work best. In this post, supported by links to deeper material, I aim to lay out the current landscape of learning and development strategy as I see it. I believe our strategy options can be categorized in five buckets as described below; further down I’ve provided additional commentary and links to learn more about some of the specific frameworks. One would need quite a bit of experience with a wide range of projects to become skilled in even a subset of these approaches. Nonetheless, it is the mark of an expert (as separate from a novice) that one can perceive patterns and recognize where certain approaches might prove useful. Therefore, it’s important to have a working knowledge of these frameworks – enough that you can recognize when one of them might come in handy. At that time, then, you can deep dive to learn how to apply what you already know to that approach (or you can bring in a professional with more experience in that area than you). The curated resources below, then, simply provide an overview of these topics. Some of the links will lead you to books that have extensive explanations, tools, and examples for quick study. It’s likely that just a few will resonate with you given the kinds of projects you encounter and the work context of the people you hope to support. By definition, L&D doesn’t own self-directed learning, but it’s clear that many modern organizations – and modern learners – count on self-directed learning for ongoing development. If an organization relies on self-directed learning as a core strategy, it may be appropriate for learning professionals to scaffold that, to teach metacognitive and self-directed learning skills if needed, and to individually assist learners in planning their long-term development. L&D professionals in these contexts should also work actively to nurture the environment and minimize any barriers so that people are able to engage in learning activities as needed. Scaffolding self-direction (Challenges of learning in the flow of work) (2016) by Catherine Lombardozzi – Summarizes what might be gleaned from the SDL literature to identify potential challenges and inform strategies for supporting learners. Names 12 “pillars” of self-directed learning that bear watching. Personal knowledge mastery (n.d.). By Harold Jarche – Harold Jarche has been writing and teaching about personal learning networks for decades, and his blog posts and white papers summarize his thinking. The Seek > Sense > Share framework for understanding how learning occurs in personal networks is quite useful. 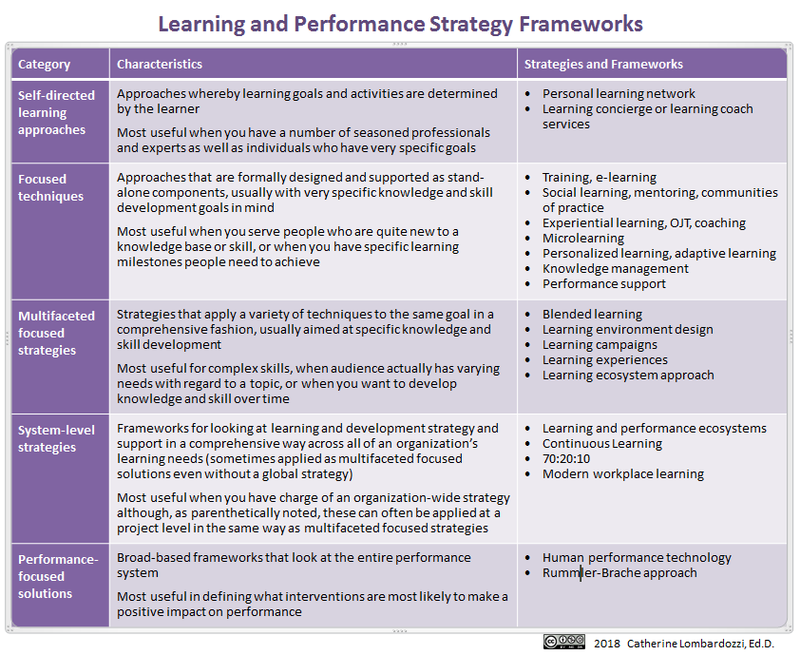 This array of strategies is what is new in L&D in the recent past and likely in the near future as well. Blended learning has been in the lexicon since the earliest part of this century, but various senior practitioners have documented specific strategies that take that concept to the next level. Each has a slightly different take, but all of these strategies marry a variety of formats in a more comprehensive strategy for supporting learning. They incorporate informal learning, social learning, experiential learning, development programs, curated resources and more. These are distinguished from the system strategies in that these are conceived to apply to developing a specific knowledge base or skill (similar to a course, but then organized radically differently and meant to provide options, not mandatory paths). Blended learning – a catch-all category for any learning event that combines multiple forms of delivery. Learning environment design – A curated set of resources to develop a specific knowledge base or skill, learning environments can be developed in an array of formats. Material here focuses on process for designing learning environments as well as underlying theory that allows us to better understand how these work. Learning campaigns (see sample chapter) – Jennifer Hoffman promotes organizing structured learning, curated resources, discussions, and application activities along with other components into a well-designed learning campaign, and she fully explores that concept in her book, Blended Learning. An overview can be found in the webinar, Learning Campaigns: An introduction and exploration (fast forward to page 16 (24:03) for discussion of learning campaigns), and here is an example course map. Learning Experience Design – Branching out from user experience design, learning experience design is a human-centered approach that integrates experiential learning and deliberately pays attention to maximizing the learner’s experience throughout a learning journey. Modern Learning Ecosystem Framework – JD Dillon’s conceptualization of effective support for workplace learning that encourages designers to build support in layers only to the point where the need is largely satisfied. Also see the Modern Learning Made Easy webinar for more. These are much like multifaceted strategies, but are conceptualized on multiple levels – meant to apply to an overall learning strategy or culture as well as to individual projects for knowledge and skill development. Like the multifaceted focused strategies, the system level strategies are conceptualized to account for the wide variety of ways that people learn as well as the interconnectedness of organizational systems, processes and people. System level strategies talk about learning structure writ large, and encourage the use of these global frameworks to conceive focused skill-building as well. The multifaceted focused strategies (above) are often a specific manifestation of these system level strategies as applied to specific learning needs. Learning and Performance Ecosystems – first fully explored at an eLearning Guild conference in 2014, learning and performance ecosystems framework discusses how the elements of an organization’s technology-based systems, procedures, content, and people can form a rich environment for learning. Bersin Continuous Learning Model – Bersin’s most recent continuous learning model characterizes learning into four contexts: education (trackable L&D), experience (stretch assignments, job rotation, special projects), exposure (connections with other professionals and thought leaders), and environment (tools, systems, support infrastructure). Human performance frameworks are bucketed separately because they tend to start with very different questions. Certainly all learning in organizations has ties to performance, and practitioners are wise to look for additional means to support performance that go beyond knowledge and skill building. That said, there are practitioners in our field whose job scope is more at the global performance and organizational design level. The frameworks in this bucket are more all-encompassing in scope, and often require experts in a variety of disciplines to engage in a solution. Human performance technology – The HPT model is one of the most widely used frameworks for performance analysis. It both accounts for a wide range of influences on performance and describes an overall flow for consulting on performance as well. Rummler-Brache – The Rummler-Brache methodology looks at process improvement at three levels: the job-performer, process, and organization and seeks to find a holistic approach to managing and improving performance.